La Compagnie des Fromages is part of the Bongrain Group, the world”s fifth-largest milk-processing company and an employer of 18,870 people. 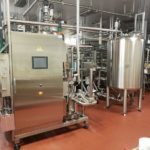 “Because we serve as a consultant to our customers, we conducted an energy audit with la Compagnie des Fromages” plant in the town of Vire,” says Jean-Yves Druillennec, Sustainable Development Manager for Cofely Axima-GDF Suez. 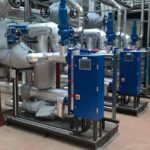 The audit, which was based on a series of measurements, provided a snapshot of the Vire plant”s consumption levels and suggested replacing its four piston compressors, which provided only cooling, by a thermorefrigerating pump. The Dyneo® LSRPM is a range of permanent-magnet synchronous motors incorporating technology patented by Leroy-Somer. The innovative design of the magnet rotor significantly increases efficiency to levels approaching 98%. The low losses of the magnet-rotor technology considerably reduce heating of the bearings. As a result, they need to be lubricated much less often and the life of the motor is increased. “We”ve implemented more than 30 applications in four years without experiencing the slightest problem,” adds Jean-Yves Druillennec. Vilter is a brand of Emerson Climate Technologies, which employs more than 16,000 people worldwide. 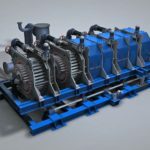 Instead of standard twin-screw compressors, the company uses a highly distinctive process – single-screw compressors. Compression is accomplished by a single screw and two star-shaped gaterotors. The compressor is designed to balance the single screw both radially and axially. This balance ensures that very low loads are placed on the bearings, thus achieving a high level of reliability with considerably reduced vibration and noise levels. This design allows Vilter to offer its exclusive 5/15 warranty (5 years for the compressor and 15 years for the bearings). The key to the single-screw compressor´s high energy efficiency is Vilter´s exclusive ParallexTM slide system, which allows the compressor to run at optimum efficiency throughout its capacity range. The capacity and volume slides (with an expanded volume ratio of 1.2 to 7.0) move independently of each other under all operating conditions, eliminating over- or undercompression and saving motor horsepower. “What makes these compressors stand out is their ability to independently adjust their capacity and volume ratio. That makes a real difference under partial load conditions. We have always found Vilter compressors to be clearly more energy efficient than the standard twin-screw technology. Depending on the application, they can be as much as 10% more efficient,” says Jean-Yves Druillennec. Cofely Axima was in charge of managing every aspect of the project, from engineering and installation, to control and supervision (PLC control, instant performance monitoring and traceability of all parameters). Only the electrical wiring was contracted out. La Compagnie des Fromages” process was down for only 3 hours, during the commissioning phase. Cofely Axima is installing many systems in countries such as Thailand, Kuwait and Italy. “We are seeing a downward pressure on prices. Our clients are interested only in solutions that pay for themselves in less than two years. It is important to be able to make promises that you are sure you can keep. Overall, Emerson”s solutions are more efficient and reliable and much more flexible for non-steady-state conditions. The entire system makes it possible to make a real difference on the total cost,” says Jean-Yves Druillennec. *COP: The Coefficient Of Performance expresses the energy efficiency of a machine and corresponds to the ratio of heating or cooling provided to electrical energy consumed. The higher the COP, the lower the electricity bill. Mimic display of an Emerson Industrial Automation drive, Vilter single-screw compressor, heat exchangers and hot-water storage system. The pre-existing reciprocating compressors remain connected to ensure maximum safety.